Cook the apples with the lemon juice, rind, honey and rosewater until the fruit is soft. Add a little more rosewater if the mixture becomes dry. Let cool. 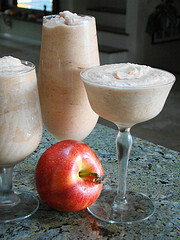 In a blender, blend the dates and apples together until they are light and fluffy. Stir in the walnuts. Spoon the mousse into 4 dessert glasses and chill. Garnish with mint leaves. *If roses not pollinated by bees, they are not fragrant. **A creation of the Medieval Spanish Chef using honey and products pollinated by bees. Should bees disappear, this recipe wold also.